Evidence with regard to the diagnostic accuracy of emergency physicians in the field remains poor [3–5]. In 1997, Arntz and co-workers investigated in a German retrospective cohort study the diagnostic accuracy of emergency physicians by comparing the pre-hospital diagnosis with the hospital diagnosis . In 10% of all cases, physicians failed to correctly diagnose the underlying diseases either by under- or overestimating the medical course of the disease. The authors found the failure rate to be even higher in certain subgroups such as stroke (14%) or severe respiratory failure (13%). Another population-based registry analysis reported trend data regarding the EMS diagnoses but without evaluating the diagnostic accuracy of the participating PEMTs . More recent trials are missing to mirror the current situation and a possible improvement in EMS with PEMTs. A growing incidence for cardio-vascular, respiratory or thrombo-embolic pathologies has been reported in EMS systems [4, 8]. We report increased incidences for the most common 20 PEMT diagnoses. 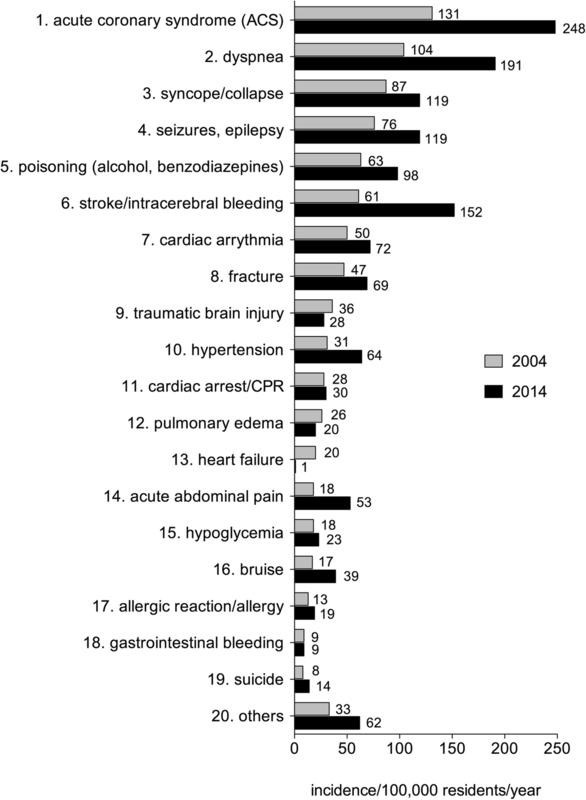 In 2014, the incidence of ACS (ranking first on our incidence scale) showed a two-fold increase when compared to 2004. One reason could be improved diagnostic options such as the implementation of 12-lead ECG devices on both PEMT units and ambulances [8–10]. Other reasons include a growing public awareness of myocardial infarction and specific training of EMS personnel . 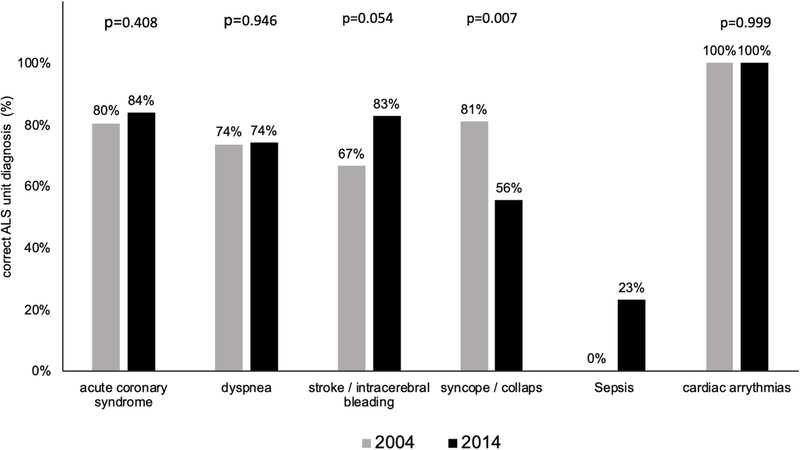 Dyspnea was ranking second and we observed a 2.5-fold increase between 2004 and 2014. A similar trend was reported towards a growing incidence of respiratory distress in prehospital emergency care . Acute dyspnea is more of a symptom rather than a diagnosis of a given disease state. Common diseases with acute dyspnea include ACS, decompensated congestive heart failure (often complicated by pleural effusion), and chronic obstructive pulmonary disease . There is increasing evidence, that additional diagnostic tools such as the prehospital chest emergency ultrasound may serve as a new tool to facilitate additional therapeutic consequences in patients with respiratory distress and thereby possibly improves prehospital emergency care in those patients [12, 13]. However, a portable ultrasound device has not yet been implemented in the EMS of Bonn. In this case, the 2.5-fold increase of the diagnosis dyspnea is not related to a possible improvement by an additional diagnostic device. We also observed a 2.5-fold increase of the diagnoses stroke or intracerebral bleeding in emergency patients. A possible explanation could be an improved connection between public awareness, prehospital care and in-hospital treatment protocols . The early recognition of stroke symptoms is crucial to minimize the delay of a life-(and brain-) saving recanalization therapy . In general, public awareness of stroke symptoms still remains poor, with reported decision rates to call for an ambulance of less than 50% within the first hour of stroke symptoms . Almost half of the stroke patients do not use an EMS at all to be admitted to the hospital . Campaigns such as the FAST (F = facial paresis; A = arm drift; S = speech; T = time sensitivity) have been implemented to improve public awareness and evidence suggests an improvement in early stroke recognition [17, 18]. 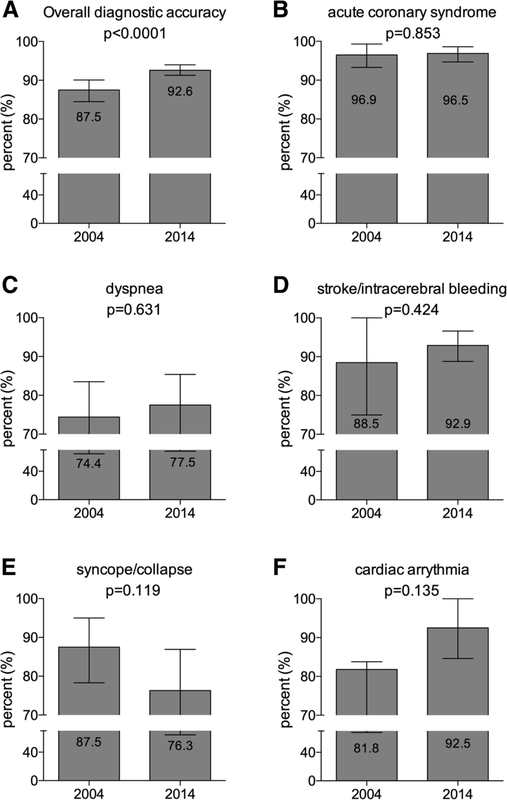 As this campaign has also been implemented in our city between 2004 and 2014, our data supports the afore mentioned hypothesis that public awareness of stroke symptoms might be improved by those campaigns. Also, prehospital emergency care is crucial when a stroke occurred to rapidly recognize the disease and to minimize the untreated downtime until a thrombolysis can be performed .